Tom Archia was a busy man in rock’s early months, as this is already (at least) his fifth appearance on Spontaneous Lunacy, though just his third as the featured artist, and not one of which is his voice even heard. Ahh, the shadowy life of an ace sessionist! As would be the case throughout rock history the road from pure session musician to a stand alone star in your own right wasn’t always an easy transition. It would happen from time to time but having someone contributing to potentially dozens of hits for a label each year made them far more valuable than perhaps having one hit themselves that year, then going out and touring for nine months before popping back in the studio for their next session and maybe to back somebody else while they’re there. In other words, it could actually be in the record company’s best interest to hope that these musicians own records didn’t break big otherwise they could lose them for the role they were more vital in. Aristocrat Records, the forerunner of Chess Records it should be reiterated, was in just such a position. Archia more or less anchored the studio band and though he’d gotten releases under his own name he continued to put in long hours backing others. Archia even moonlighted for other companies, as we’ve recently seen when he backed Big Maybelle on Sad And Disappointed Jill for King Records in Cincinnati, as well as the forthcoming Good Rockin’ Tonight by Wynonie Harris which would shake up the world thanks in part to his contributions. Yet he also led his own band for public appearances around the area and was quite popular doing so, therefore it was unlikely that Aristocrat could simply hope to keep him completely under wraps for long. Thus they gave Archia the opportunity to put out his own records, although surely there were mixed feelings amongst the Aristocrat hierarchy when eying their commercial potential. I’m sure they wanted them to sell enough to keep him happy and put some dollars in their own pocket, as Aristocrat was hardly in the black by this point in their evolution, but a really big hit would almost surely cost them their ace horn as he’d find it far more lucrative to tour as a headliner than to earn scale playing behind whomever they pushed in front of a microphone session after session. Such was the rock ‘n’ roll kingdom before self-contained headlining bands came into vogue. Based on the returns of his records thus far such a leap to the big time status of hit maker was hardly imminent and so Aristocrat had little reason to worry. Archia’s first record, the decidedly off-color Fishin’ Pole, wasn’t a hit but wasn’t a complete dud either and so for his follow-up they put out yet another slice of dirty double-entendres giving him something of a niche to be slotted into. Perhaps even the thinking was that should any of it connect in a big way he’d STILL be somewhat limited in terms of touring ability, as some of the more swanky rooms might not want a headliner who specialized in decidedly X-rated material. But that’s where the strict similarities end for Fishin’ Pole had a lot more bounce in it than Ice Man Blues indicating they ran out of the 40’s version of Viagra – oysters maybe? Regardless, this is slower, more labored, a bit bluesier than its predecessor and not quite as good. Because Archia was a sax man, not a singer, he was resigned to either cutting strictly instrumentals, which may have actually been a better bet for success at this point (though at the time he laid this session down in the fall of 1947 the instrumental in rock hadn’t yet been mined commercially), or else he’d be forced to take on a vocalist. In other words, he was STILL backing someone, regardless of what the label credit read for the artist. Here the role falls to George Kirby rather than Buster Bennett who handled the chore for Fishin’ Pole. Since this is Archia’s record however you’d think that his own role accompanying Kirby would be far more prominent, but his presence here is languorous compared to what we’re used to with him. He plays as well as ever, the intro has a nice sultry feel to it, but then it starts to wander around the melody like a drunk in the night. Some of the passages are effective, others are more indulgent, but at no point do you sense that this is leading anywhere. It’s an exercise in noodling and as a result the musical excitement is ratcheted way down and it will be left to the lyrics and Kirby’s vocals to try and pull this one off. On the surface that might be a risky move since George Kirby was only a part-time singer to begin with. In fact his primary success came as a comedian around Chicago, a frequent emcee at clubs which is how he wound up hooking up with Archia and thus Aristocrat Records. Yet he sang too and possessed a good voice, strong, clear and resonant which is put to good use here. Though Ice Man Blues was his first opportunity for national exposure and didn’t do much in the way of making a name for him, in time he would go on to make a lot of television appearances as a comic (as well as singer, dancer, impressionist, you name it) in the 1960’s and early 70’s, a time when such opportunities for African-Americans on the networks was decidedly limited. So Kirby’s got the requisite attributes to handle this type of song without a problem. Just what type of song are we talking about? Well the ice man euphemism for a sexual lothario (the door to door delivery man hitting up married women while their husbands are off at work) is a well-worn one, in fact Blind Blake sang a popular blues song with this title back in the late 20’s that, while a totally different composition, had the same basic premise, so it’s unlikely that even those who hadn’t heard Fishin’ Pole would be unaware of where this was headed upon seeing the title. That’s good, because wanting to hear the racy details for yourself is really the song’s primary appeal. Kirby’s vocals are fine and quite smartly he’s not being presented as lecherous, more like a cat who is so confident in what he’s offering – and by the sounds of it has had plenty of takers – that he barely finds the need to, shall we say, advertise his “services” around town anymore. The lonely housewives all know his number and he knows darn well they’ll call him when they start heating up in all the right places and need him to deliver some ice in order to put out the fire down below so to speak. It’s vital that Kirby understands how to deliver the material with the right emphasis to get across the dirty jokes – as he clearly does – and he matches up well with the slackened pace of the music. In a way the slow tempo is part of setting up this reputed boudoir charmer’s entire persona. While the men of the town are busy breaking their backs at their jobs to bring home the bacon, Kirby saunters into their homes like a sexual chicken thief, taking the choicest birds to pluck at his leisure. In that sense the drawn-out pace works well from a purely structural standpoint, but while the design may be architecturally sound it can’t help but come off as aesthetically lackluster in its delivery. (Feel free to insert your choice of bedroom analogies here to get this point across – slower may indeed be better in some instances, but unless there’s some unbridled enthusiasm to the proceedings it’s probably going to be lacking any sort of explosive climax… you get the idea). Basically the song needs more URGENCY, more musical raunchiness to highlight the humor, not to mention the sexual bump and grind that goes along with it. There’s a myriad of options at their disposal to do this too, any one of which would suffice. They could use a stop/start technique where some more ribald musical interludes would provide the appropriate compliment to the lyrical set-ups and punch-lines. They could simply up the tempo at certain times to get the ventricles pumping like the act itself calls for. Even just having Archia add one bawdy sax solo that suggests what’s going on behind those closed doors when these women let the ice man in their door – drums slamming, piano accenting the woman’s cries of delight, while the horn… well… acts horny in the best sense of the word – would be an improvement. If that’s all that you’re offering in the way of excitement – a mildly dirty euphemism with absolutely no musical… err… thrust behind it to deliver it with – I’m afraid you won’t find many takers unless they’ve been on a desert island without any physical companionship for a few years. Ultimately that’s what does this in, the concept is a strong one but we’re just not hard up enough to get a kick out of this in the time it takes to get through the whole elaborate drawn-out tryst before her husband gets home. In fact you almost hope he knocks off work early, walks in unexpectedly and surprises them while her ice is – shall we say – being delivered and the husband starts making ice cubes out of the delivery man… just so we can get some more action here to keep us interested. My guess is this all worked better live, where visual cues can be added, a raised eyebrow from the bandstand here, a few hand gestures there, certainly more risqué ad-libbed give and take between Kirby’s lines and Archia’s sax replies to sell the jokes, and especially the audience’s collective responses that would heighten the sense of all being in on the suggestive adults-only routine together. Both Kirby and Archia were well-suited for such embellishments too, but without that being offered though it comes across more like reading a manual on the clinical aspects of sexual reproduction that’s lacking the dirty pictures (or the hands-on assistance of a nurse to guide you through the steps) and as result fails to get your motor suitably revved up. The raw materials to make this work are all present and accounted for, and it’s certainly not bad by any means. The storyline is tried and true, the role of the protagonist is played well and though the musical side is rather lackluster it isn’t out and out inappropriate for the content. 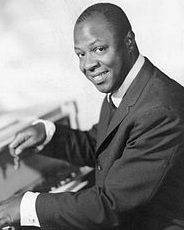 It’s also nice to see George Kirby get a fleeting moment in the spotlight here to touch upon his historically undervalued career as a trailblazer in the mainstream for black performers. So all that is well and good. Yet the record in question is what we’re mainly concerned with around these parts and it simply isn’t all it could be, something that’s all the more frustrating because we know the participants involved were more than able to construct such a song and have it work better than this. Unfortunately though here they take their sweet time delivering it and so by the time he gets to your door to “cool you down” the ice will have all melted. 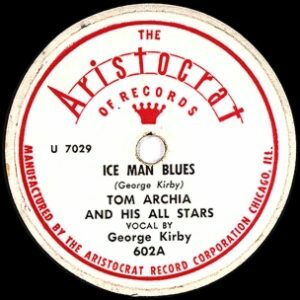 Leave a reply on "Tom Archia & His All-Stars: “Ice Man Blues”"